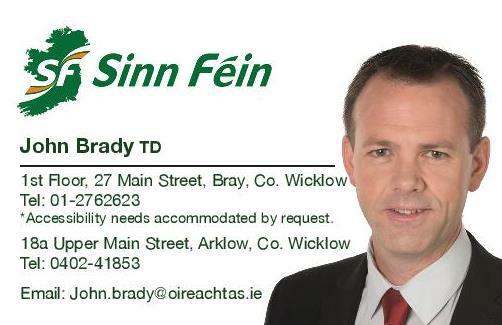 Sinn Féin TD for Wicklow/East Carlow John Brady has said the government’s decision to allocate such a huge proportion of available resources on tax cuts shows that it does not understand the reality on the ground for ordinary families. “The Government know that it is possible to balance the books while at the same time beginning the process of sorting the crises in our health and housing sectors through meaningful investment. Sinn Féin’s alternative budget demonstrates exactly that. “Every cent that the Government have put into tax cuts is money that could have been used to rebuild our health services and to build homes. “Budget 2018 has underfunded the health service in order prioritise tax cuts. Today, the Minister of Finance announced €685 million for the Health Service in Budget 2018. Yet, the Health Service actually needs an increase of €691million next year simply to stand still. “At the height of a crisis with nearly 700,000 people on hospital waiting lists and over 514 people on trolleys today alone, these measures in Budget 2018 for the Health Service will exasperate the crisis. “When it comes to housing, despite making over 52 ‘policy’ announcements since his appointment, Minister for Housing Eoghan Murphy has not delivered any additional housing units above those already committed to by his predecessor Simon Coveney. “Despite there being between 90,000 and 180,000 vacant homes across the state, Budget 2018 has delivered nothing to increase access to these much needed houses. The Repair and Lease scheme budget has not been increased. There is no increase in Buy and Renew Budget. Crucially, there is no vacant homes tax. “The Budget’s biggest failing is the lack of any measures to provide any affordable rental or purchase housing. The government has no target for delivering affordable housing. The Local Infrastructure Housing Activation Fund is down. There is no guarantee that the Home Building Finance Ireland will deliver any homes in 2018, let alone affordable homes.